In much a similar way to parents being shunned from having a favorite among their children, it feels wrong to say I have a favorite section of my garden. But I do. The cornstalks are shiny and stately rustling in the plains wind, the deep jewel green leaves of the squash plants are mysterious and exotic, the bright rows of herbs and lettuces are as lovely as any flower garden. But there is another section, a haven, a quiet sort of oasis of sweetly sharp scented leaves and jeweled toned heirlooms in every shade of purple, red, brown, white, yellow, pink, and orange: the tomato section. From the first of their unique scent at the end of winter when early tomatoes are peering brightly up at grow lights to the last days of harvest in fall when the last fruits are small and more useful for seed than culinary purposes, tomatoes will always be my favorite plant to grow. Thus every year the heirloom features here will no doubt include a tomato type, this year being no different than last on that count. And once again, like last year, one of the standout tomatoes this year has been a saladette cherry type, namely weissbehaarte. 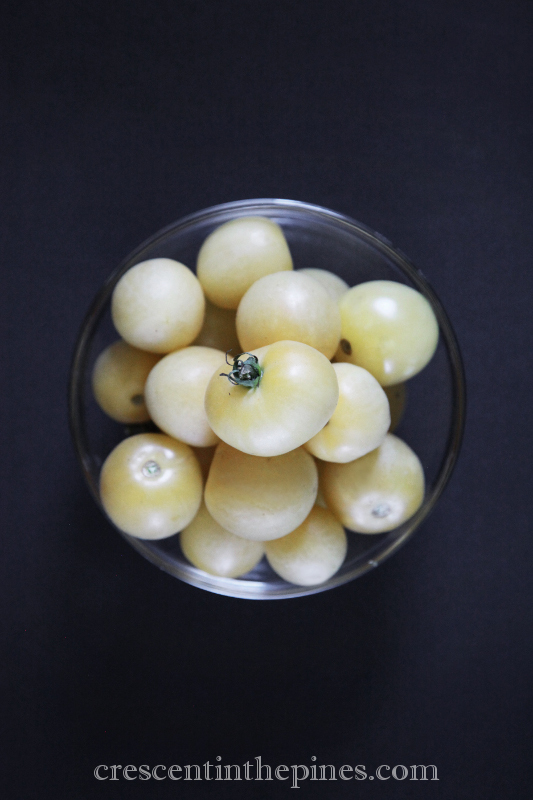 Not only is the weissbehaarte prolific to the point of overwhelm from early to late season, but for someone who would rank white types as her least favorite of the many hues of tomatoes, the taste is surprisingly delicious. 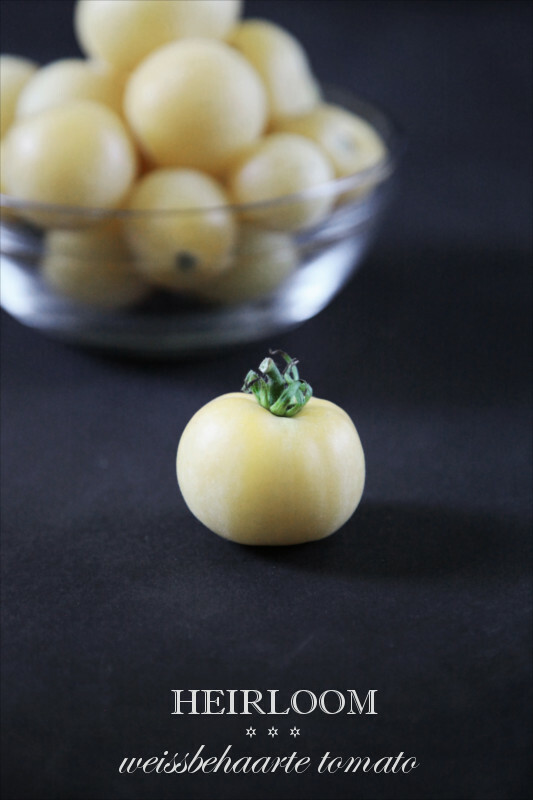 They are milder than a typical white tomato and are particularly visually appealing when served fresh in salads or on an appetizer tray. Their skin is remarkably smooth with high crack resistance and in color ranges from a soft near white pale yellow to bright pastel sunshine gold. Such a unique and pretty tomato type, they are not only an attractive plant in the garden, but also garner many compliments on the table. 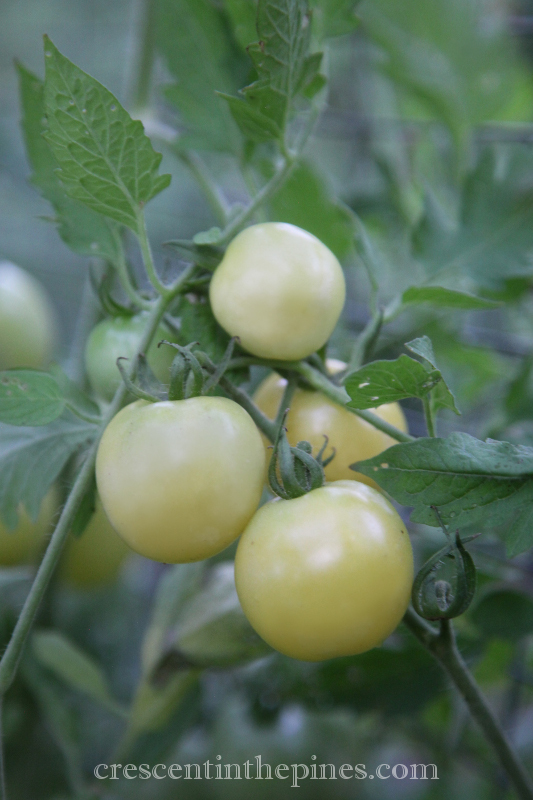 Weissbehaarte (Solanum lycopersicum ‘Weissbehaarte’) is an old German heirloom. Skin is thin and silky, pale yellow in color. One to two ounce plum/salad type. Vines grow large with plants growing six to eight feet and produce prolifically. Very easy to grow with enough space. Indeterminate, 75-80 days.